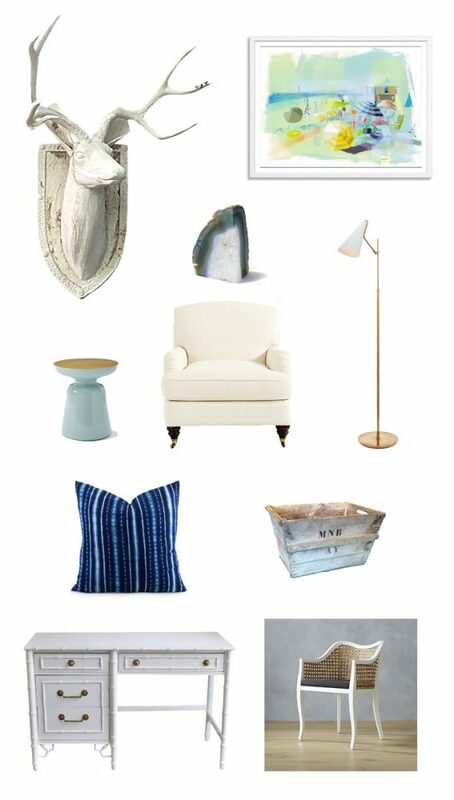 Lately I’ve been dreaming about redecorating our living room to create a lighter feel. Somehow we’ve managed to collect two brown leather sofas, and three black and wood mid-century chairs. It’s a lot of brown and black, especially since I tend to gravitate towards white and light. The leather sofas have to stay for now. We love our dogs and let them sit on the furniture, and I wouldn’t sacrifice cuddling with them just so I could have a light colored sofa. My plan is to replace some of the accent pieces around the room with some vintage or vintage feeling pieces in lighter colors. We also have a lot of mid-century modern items or new items with mid-century lines, and I think we need to mix it up a little. I really love vintage farmhouse style, and while I would never decorate our 60s ranch entirely in that manner, I think I can strategically add a little shabby chic here and there. I always go straight to Chairish when I’m looking for vintage inspiration because it’s so easy to find amazing pieces. I would never hang a real deer head in my home, but I love this chippy white ceramic one for over our dark gray fireplace. The faux bamboo desk, also a Chairish find, would replace my oversized big brown desk in our front window, which will really brighten that corner. I love the lines of the modern cane back chair from CB2 with the desk. I have been really into blue lately, and it features pretty prominently throughout our house. I would mix this oversize pillow from Furbish with a couple linen ones on the sofa. And, I’ve been dying to bring a Teil Duncan print into my home. This one would work perfectly over the sofa. In front of our other big window, I’m planning to create a cozy reading nook with the slipcovered chair, mid-century floor lamp and glossy blue side table. The bin will be perfect for holding magazines and dog toys. I have so many other ideas floating around for this room, but this is the direction I’m planning to head over the course of the next year.